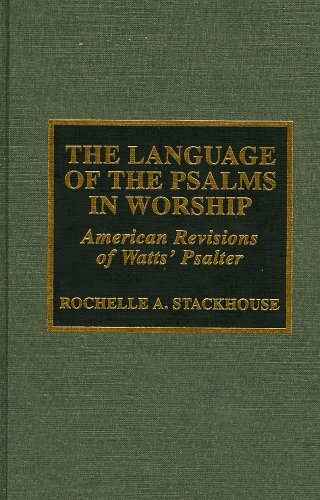 The Language of the Psalms in Worship shows how the changing political context that followed the Revolutionary War spurred a need to change the frame of reference portrayed in the texts of Watts' Psalter. The psalms were revised, not only to eliminate overt Britishisms, but to express the singularity of the American Christian experience. This illuminating study shows how the American liturgical language emerged, as well as demonstrates that sensitivity with regard to liturgical language is not exclusively a modern concern. Appendixes list known editions of American revisions to the Watts' Psalter, significant revisions in parallel columns, and which texts were substantially changed or added by Mycall, Barlow, or Dwight. Bibliography.